I have soooooooooooo many cookbooks. But I still love them and I love looking at new ones. What I really love is when I find one that's different from the rest of the genre. 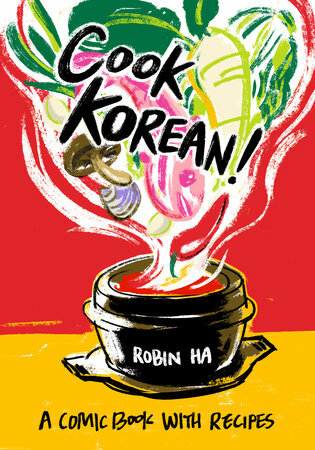 That's true of Cook Korean by Robin Ha. It's a cookbook and a comic book. It's not a comic cookbook in the sense of being funny. It's a cookbook in comic book style. With drawings and stuff. It's certainly different. The ingredients, fortunately, are always in a box where they're easy to find and read. Instructions are in a flowing comic book style as opposed to panels, so you need to make sure you follow the correct path from start to finish. The drawings are cute, and sometimes helpful, like when they show what slices should look like. The front of the book also has helpful information about Korean ingredients, which will come in handy when you're shopping. As far as recipes, this has everything from home made kimchi to main dishes to drinks to Korean fusion recipes. Some ingredients might be hard to find locally, but that's where Amazon comes in handy. Things like buckwheat noodles or gochujang might not be at your grocery store, but they're easy to find online. Other ingredients might be trickier, like fresh vegetables or unusual types of seafood ... but that's when creative substitutions come in handy, right? I thought that the comic book style would be the hard part about working with this book. However, sourcing ingredients has been a bigger challenge. If you're up for that, the recipes look pretty darned good. Me, I'm going to be subbing a lot of things as I use this book, because some of them are going to be too much of a problem to find locally. Still, it's a fun book, and I do like a challenge! I got this book from the publisher for the purpose of a review.